Product #60779 | SKU 996371001 | 0.0 (no ratings yet) Thanks for your rating! 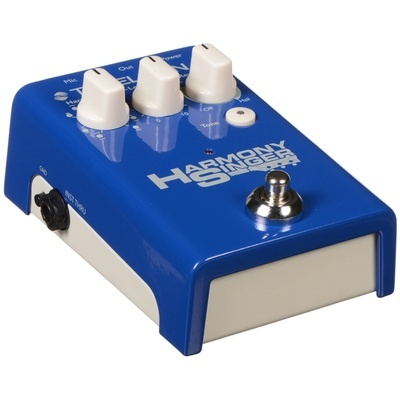 The Harmony Singer 2 from TC-Helicon is a guitar-controlled vocal harmony and reverb generator that's housed in a stompbox enclosure. Whether triggered by electric or acoustic/electric guitars, and whether utilised in professional gigs or practice sessions, the Harmony Singer 2 can make your vocal performance sound as though a couple of backup singers suddenly turned up to join you in perfect harmony. It improves upon the original Harmony Singer by giving you the option of using four AA batteries to power the pedal, thereby making it more portable than before. The pedal accomplishes such harmonious bliss by instantly analysing your guitar chords as you play, so that when you hit the footswitch, the harmony backup group is in tune and on time. And borrowing from the expertise of its sister company, TC-Helicon has included quality reverb algorithms, featuring room, club, and hall styles for enhancing any style of performance. When it's time to talk to the audience, the harmony function can be switched off while the other vocal processors remain in place. This action can also be performed using specific microphones that comply with the Mic Control protocol. The pedal is simple to connect—microphone to Harmony Singer, Harmony Singer to PA, and that's your whole chain. The guitar connects the same way you'd connect your other stompbox effects, except that the Harmony Singer should be first in the chain.